The Explorer Series is the perfect balance between price and value. 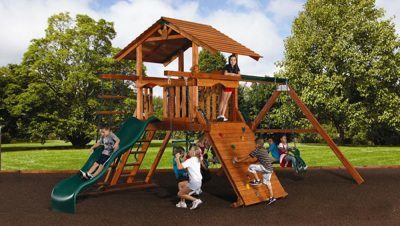 It is a high quality series with many heavy-duty features like the Treehouse and Peak Outdoor Playsets. Explorer Playsets are designed for children of all ages. 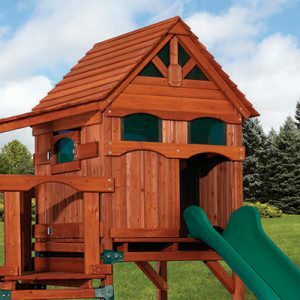 The Wooden Swing Outdoor Playsets Explorer Series is the younger sibling to our Treehouse and Peak series, and is comprised of two different fort structures, the Magellan and the Mountaineer, each with unique standard accessories. The Magellan uses a vertical fort structure with wood roof, 5’ rock wall and picnic table. 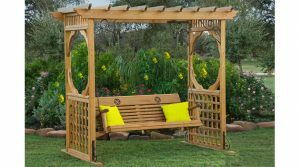 To this you can add slides, swing beams, and tons of accessories just like all other Backyard Adventure sets. 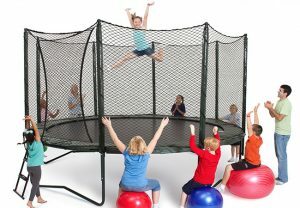 The Mountaineer uses an angled fort structure with wood roof, 5’ rock wall, tire swivel swing, accessory arm with rope ladder, and accessory arm with trapeze bar. Like the Magellan, you add your choice of slides, swing beams, and a bunch of accessories to make the perfect Explorer swingset for your family. 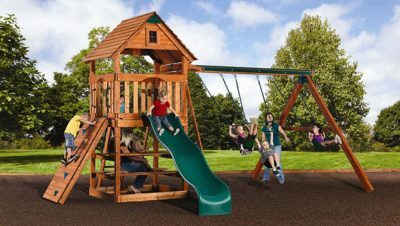 Compare the wood, accessory options, construction and design of similarly priced Playsets and you’ll see why the Wooden Swing Playsets Explorer Series is the indisputable leader!